A recipe for how to make Elderberry Syrup with elderberries, honey and essential oils. A natural antioxidant anti-inflammatory immune boosting syrup your kids will love! To a large sauce pan add dry elderberries, water, honey and cinnamon stick. Bring to a boil. Reduce to simmer for 30 minutes. Strain the mixture into a large bowl or mason jar. Add lemon oil, citrus oil, cinnamon bark oil, clove oil, and thieves oil. Stir everything together. 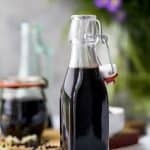 Store elderberry syrup in an air tight container (I store mine in a large mason jar) for up to 3 months. ** Adults can take up to 2 tablespoons per day. Childcare can take 1 teaspoon per day.